Colleagues from EquityPAC attended the Evening at Acton which featured Arthur Brooks, Ph.D. and President of the American Enterprise Institute. The event was on Bringing America Together: Restoring Optimism, Unity, and Opportunity. On Monday night, my colleagues from EquityPAC and I attended the “Evening at Acton” which featured Arthur Brooks, Ph.D. and President of the American Enterprise Institute. The event was on “Bringing America Together: Restoring Optimism, Unity, and Opportunity." It is likely no coincidence that only a few years later Republican voters have put a President in office who clearly favors widespread deregulation to the detriment of community good and that our political discourse so regularly conflates religious conviction and unmitigated corporate overreach. So it is always interesting to listen to Dr. Brooks and look into the political crystal ball. Often what is said by AEI defines part of the political discourse that causes serious concern to Equity PAC and our membership. Two messages from Dr. Brooks rang loud and clear during his talk. The first message was that the rich don’t need poor people anymore, and Dr. Brooks thought that was a problem. The kernel of the idea being that for a society to have some sense of cohesion we need to feel needed. His opening salvo was chilling. He pointed out that most of the people in the room (99 percent white, older and mostly society donors excluding our EquityPAC contingent) could go home, continue on with their life and never really come into any major contact or even think about poor people. I thought he was going to go down the road of segregation or the inherent problems these rich running lanes cause for our policy making. But he didn’t. Instead, he said there used to be a time when poor people appreciated minimum wage jobs and that today poor people don’t. He said we need a society that makes people needed more. This was vague to me, so I asked him “What are poor people supposed to do until they are finally needed?” He made arguments on how the work before us is around deconstructing the war on poverty and creating policy that is smarter and more empowering. I partially agree with what Dr. Brooks is saying at a high level, though I imagine we don’t agree on the details of this thinking. We need a safety net that empowers. However, markets alone will never solve poverty because poverty is literally a failed market. However, I am less concerned about how big or small government needs to be to advance equity and solve poverty, as I am in the angle of his response. Nowhere does Dr. Brooks acknowledge the lived experience of people in poverty. Often, the discourse on the right is centered on frustration with the lived experience of marginalized people: “Why is Black Lives Matter marching and blocking traffic?” “We should drug test the poor before they can receive subsidies!” “I don’t want to pay for my neighbor’s laziness!” This is confusing because if society doesn’t need the marginalized or the poor, wouldn’t we expect them to organize? To medicate? To not have a job? What exactly are we expecting of the poor and marginalized if we all agree they have been discarded? Dr. Brooks offered a vague means to a mysterious end. Would this end empower people and lift them out of poverty, or simply widen the gap between rich and poor? 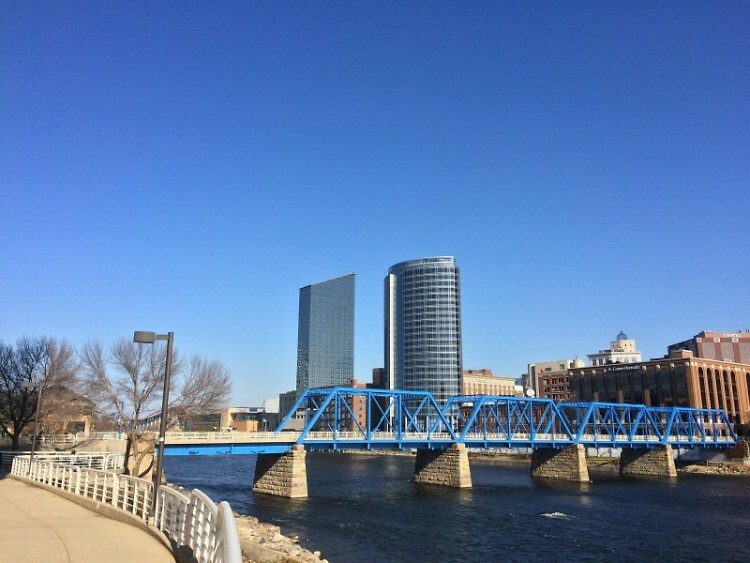 Look no further than the huge gap between the haves and the have nots in Grand Rapids or the oft cited Forbes article that ranks us among the worst economically for African Americans to answer that question. Dr. Brooks’s second point is that we have lost our sense of ‘niceness’ or ‘moral order’ in this country. He used this word “moral order” a lot in this discussion which feels a lot like a very particular set of Christian rules that are only clear or germane to some. Dr. Brooks told a story about a man from Texas that read one of his newly published books. The man apparently sent him a highly critical email about his work. Dr. Brooks, instead of responding with arguments or contempt, responded with niceness. This niceness ultimately caused the man to be more conciliatory and invite him out to dinner. Dr. Brooks didn’t take him up on that offer because it would have been awkward. Therein lies the rub. The moral of this story isn’t that Dr. Brooks respected this man or considered the criticism. This idea of “niceness” or “moral order” is used in a way to reduce the chance of more immediate, direct action against more conservative policy. It’s a public relations game for those who are very happy where they are – fully in command at all levels. Malcolm Gladwell in "David and Goliath" makes the point that usually the little guy wins more than the big guy because the little guy can “break the rules." Advance the primacy of niceness and those who are powerless and waiting to be needed revert back to sitting on sidewalks, hat in hand begging for attention yet being perfectly respectable to those walking by. Moral order restored. It’s a brilliant play for those in power right now. But for those truly working to advance a society where all are needed, faux appreciation should be ignored unless it is focused on changing outcomes and acknowledgement of our arguments. I don’t think I heard any true appreciation of democracy from Dr. Brooks, but he certainly is trying to kill it with kindness. EquityPAC was formed in March of 2016 to continually increase the number of equity-minded officials, policies and practices in Michigan.